Martins traditionally used tree cavities for nesting, but now houses supplied by people are their primary form of residence. 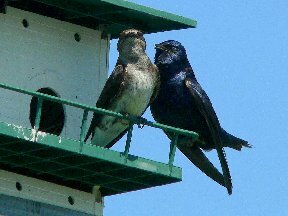 Purple Martins are named for the purplish sheen on their bodies. Expect Martins to return from their Brazil wintering grounds around March 15th. Providing housing for Martins is certainly more of a challenge than for other birds. Many varieties and considerations need to be considered to see if it is right for you. Martins actually prefer being close to humans, perhaps because they know it will help them stay safe from predators. The Martin house should be at most 100 feet from your house, but not any closer than 30 feet. They also like the house to be in an open area with the fewest trees in your yard. Air space at the house should be void of trees in at least a couple of directions for 40-60 feet, and the entire open area should be no less than 80 x 80. Although not required, they seem to prefer housing with a proximity to water. Placing plastic purple martin decoys on the house will also get their attention. The two main varieties of homes are multi-room and gourd systems. They can be combined on the same pole system. The best material for multi-room units is aluminum, because aluminum stays cooler in the summer. Wooden houses are better insulated and will retain more heat than aluminum houses. They should also be almost white to reflect the sun and stay cool inside. An advantage to hanging gourd nests is that they swing in the wind, which does not bother Martins but will discourage Starlings and House Sparrows from using them. Telescoping poles are nice since they can be easily raised and lowered for maintenance. Once you raise your housing unit on the pole, you can leave it alone until you take it down for fall cleaning. However, if you engage in more active maintenance you can increase the nesting success and the number of Martins. For example, checking nests regularly can help to discover problems like unwanted nesters, predators and blowfly infestations. Accurate record keeping can help your success over time. After lowering and inspecting the house, it is VERY IMPORTANT that the house be returned to the exact height and orientation. To facilitate this, use a permanent marker to mark your pole so you can return it to the same vertical and horizontal position. The house should never be tilted after nesting begins as it may damage the nest and eggs. The best times to inspect are mid afternoon, but avoid doing it during cold, rainy or windy weather. Keep in mind that not all of the eggs will hatch and not all of the nestlings will fledge. This is normal. Placing platforms around the house can aid in nesting success. You can also put crushed eggshells and mealworms on the platform. Eggshells will facilitate calcium and egg production, and the mealworms are for eating. Perching spots around the house also make it more desirable. Enjoy your adventures with Martins and if you have additional questions, do not hesitate to ask. We love our Purple Martins. We keep our nest boxes close to the house and the birds seem to sense when we are trying to help them. The only problem we have are arial threats from Hawks, and Cooper Hawks. We have installed baffles on our martin poles to keep the predators from the ground such as raccoons, oppossum and snakes away and that has worked well. These baffles are essential to keep Martins nesting in your yard. Does anyone have suggestions for the hawk problem? We have been fortunate to have these insect loving birds since 1989 on our farm in Jefferson County. We have a large pond about 300 feet from the nest boxes and plenty of room for their flight patterns. They remind us of the 52 bomber in flight and build. Right before they return to their southern wintering grounds, they along with several others, congregate around their nesting boxes in mid air, circling and circling, chattering to one another as if to say goodbye. We then know they are homeward bound and we wait for their return. They are one of the most enjoyable birds you can have in your yard. Sorry, I do not know of a way to deter the hawks. I’m curious if there is some sound that will help chase away the hawks, but not bother the martins. The only other thing I can think of is to be outside close to the martin house making noise frequently. What is the pure flower in lower right box in the display of 6 plants? Are you talking about the pictures from the photo gallery on the 3/28/17 email newsletter? The lower right flower in that photo gallery is from a butterfly bush available in the nursery at Hillermann Nursery & Florist. Let us know if you are talking about another picture. Thank you for asking.